I just wanted to thank you for night's training session. I truly enjoyed your methods, as well as your stories and jokes. Your techniques are very "real life" effective. Like your bumper sticker will say, "Perfect techniques for the imperfect person." I feel honored to have met you and hope that one day our paths will cross again. You are one of the good ones. 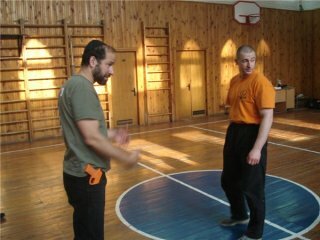 Moshe Katz offers Krav Maga seminars in Israel and around the world. 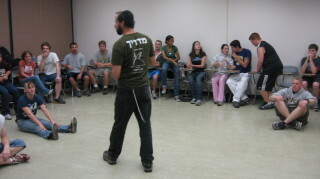 At least twice each year Moshe travels to the USA and Canada and Mexico. Seminars in Europe, Asia, South America, Central America or Africa are available at any time, by invitation. To arrange a seminar contact the IKI Office or Moshe Katz directly. Over the past 15 years Moshe has conducted seminars at more than 750 martial arts academies, colleges, universities, and military bases around the world. Seminars can be conducted in English, Italian, Spanish, Portuguese or German. Seminars can be tailored to the needs of the of the group. There are many topics to chose from. International seminars usually range from two days to five days. Please Note: Flight and travel expenses need to be paid in advance. This includes the flight and taxi. This plus deposit is full payment for seminar. In the event of cancellation the seminar deposit is non-refundable. Seminars are $750 per day, plus expenses, unless other arrangements have been made with the IKI office. For locations outside the USA/Canada (i.e. the North America trip). Expenses are: Seminar fee. Round trip airfare, taxi to and from airport in Israel, airport pickup and drop off abroad. Food and hotel. For flights leaving Israel Moshe Katz flies El Al Israel Airlines. (unless someplace like Kazakhstan or Albania where El Al does not yet fly.) Connecting flights can be with any airline other than Arab airlines. (for obvious reasons). All flight expenses must be incurred by hosts including unexpected costs as may arise from time to time. Once a flight has been booked there can be no cancellation. Cancelling a seminar incurs the full cost of the seminar, hotel and food expenses. i.e. If a seminar is booked within the USA, Canada, or Mexico, which is part of a tour, cancelling an event has a domino effect. If event B is cancelled, I still must be at location B in order to catch the flight to event C. Thus a cancellation incurs ALL costs incurred as a result of the cancellation of the seminar. Note: I do not want any cancellations. As such I make the policy as to let potential hosts know that they will lose out by canceling. It pays not to cancel. I have had too many cases in the past where after booking a seminar, planning on the seminar and counting on it I suddenly receive an e mail, "So terribly sorry but I have to cancel, I hope this causes you no inconvenience." I have designed my policy in order to avoid such experiences. In the event of a cancellation the flight money is forfeited and 50% of the seminar fee must be paid. Procedure: once we set a date for a seminar I will look into a flight. We agree on flight details and cost. Two options for payment. 1. My agent at El Al contacts you directly and you pay him via credit card. 2. I send you an invoice for the flight and I book it here in Israel. This way if there are problems, as there have been many times in the past (volcanic ash, contaminated petrol, storms, snow, war) I have one individual whom I can contact rather than go on a wild goose chase trying to contact an airline. Trust me, I know what I am talking about. With other airlines I have found myself stranded in a foreign country trying to explain myself in Spanish in the middle of the night, or in German while panicking that I will not make my connection. I have been stuck at the airport without internet, without a working international phone, surrounded by Chinese speakers, Italian speakers, Russian speakers, trying to reach someone. Trust me, do not argue with me on this point. I book my own flights. There can be no compromise when it comes to my safety. When on tour within North America there can be as many as 20 flights or more. 1. Never take the initiative to book the flight on your own. These flights must be booked together, me and the host, in order to find the best flight that suits our needs. For your sake I try to choose the least expensive flight. For my sake I try to choose a flight without three connections. For your sake I try not to choose a flight that involves you waking up at 3 am and driving 2 hours. For my sake I try to choose a flight where I can get a decent night sleep. Thus we must speak and chose the best flight together. 2. No seminar is considered booked until the flight is booked and paid for. Without a booked flight I have no guarantee the host will not change his mind at the last minute. 3. Flights must be booked and paid for well advance -When I ask for them to be booked. If you do not have the money to book a flight a few months in advance, you should not be hosting a seminar. Understand that this is a domino effect; I only book flight number 3 on a tour after flight number 2 is booked. For example if I am flying New York - Chicago - Los Angeles, I will only book Chicago - Los Angeles after I have booked New York - Chicago because if Chicago cancels then my Chicago - Los Angeles flight is lost! 4. Travel Protection: In the past I never insisted on "Travel protection", it is another $15- $20 but I figured why waste the money. These days with cancellations due to weather, storms, and other technical difficulties I feel it is necessary. So be prepared to pay another few dollars. Better this way than losing the entire cost of the flight, which has happened too many times. 5. Travel Visa - Moshe Katz holds two passports so a Travel Visa is rarely required. However in cases where a Travel Visa is required that must be paid by the host in advance. Hotel, food, coffee, will be paid for and arranged by the host. Hotels should be Best Western quality or better, not "Super 8" , or "Americas Best". All hotels should be clean, smoke free, safe, and include a quality breakfast and WiFi. Motels are not an option. If there is free time please understand that these trips are very tiring. Moshe is quite happy relaxing in the hotel before the seminar. He does not need to be entertained round the clock. Please understand that he is coming to teach Krav Maga, not as a tourist. It is more important to be well rested and prepared for the seminar than to see the historic sights of the town. Many instructors use seminars as an opportunity to stay out late and party. That is not the case with Moshe, he wants to be well rested for the seminar. The basic standard format is to begin...at the beginning. We start with the basics, the foundations and progress from there. Seminars can be tailored to the needs of the group; young, older, police, military, office workers, airlines etc. If you are making an effort to have an event, and inviting an instructor, you should do everything possible to make it successful. Moshe Katz teaching seminar near Kiev, Ukraine. Accelerate your progress, the fastest way to improve your Krav Maga and achieve rank or instructor status is to come to Israel. More details about Krav Maga Tour and Train Israel. I just wanted to let you know that I cannot thank you enough for your visit. It was therapeutic for me in a number of ways. It was GREAT seeing so many students in there, all learning and getting excited about Krav Maga. We love what you bring to your seminars. Your passion for teaching people to learn to defend themselves matches our, and I see good things coming from that! This world is getting scarier every day, and I feel great about myself knowing that I teach people how to defend their lives. I'm excited about continuously learning from you. You are an awesome mentor in many ways. I have been through 2 of Moshe's seminars and WILL be at this this one. Moshe is a fabulous teacher who makes everything so easy to learn. I would just like to take this opportunity to thank you for the training and stories you told during the training. All the small little tweaks have make a big difference, thank you again. As for the stories\truths they really touched my heart and I won't forget them. I have actually told them to a few people already and I can see them pause and think about it and understand the underlying truth behind the events. Thank you again for you wisdom, understanding, forgiveness and training. ... and not only attending a seminar with you is crucial. who knows me and sees me at seminars, will sometimes wonder why I write all the time. I can also remember that you once asked me what I write down all the time. if we have attended more than one seminar of yours, each seminar usually starts with the same or similar techniques and you should believe that after 8 years of training with you I also know the techniques. but it is important to me to look behind the technology. to understand you as you explain what you mean like ... sometimes the story about the single techniques is more helpful to me than the technique itself, because if we understood the principle the experienced trainer himself would come close to the same technique.